Catch up on your state trivia with these Vermont history firsts and interesting fun facts about the state. 1609 - The area which is today Vermont was first explored by Frenchman Samuel de Champlain in 1609, when he claimed it for his home country. Revolutionary soldier to shed British blood at the Battle of Lexington, April 19, 1775 was Solomon Brown from New Haven, Vermont, who thus fired the first effective shot in the Revolutionary War. Ethan Allen and his Green Mountain Boys won one of the first important American victories of the Revolutionary War by capturing Fort Ticonderoga and Crown Point. Stars and stripes flag to lead American armed forces on land was the Bennington Flag used at the Battle of Bennington on August 16, 1777. Constitution to provide for a system of public school education was Vermont's in 1777. Marble quarry was started at East Dorset in 1785 by Isaac Underhill. Copper cents minted by a state were authorized by the Vermont General Assembly in 1785 and made by Reuben Harmon, Jr. at Rupert. 1789 - U.S. congressman elected who had served time in jail was Matthew Lyon of Vermont (1789). Jailed under the terms of the Alien and Sedition Acts, later declared unconstitutional, Lyon was re-elected to Congress while still in jail. 1791 - State admitted to the Union after the ratification of the Constitution was Vermont on March 4, 1791. 1792 - Morgan Horse, owned by Justin Morgan, was brought to Randolph in 1792. 1793 - Copper mine was opened in Strafford in 1793. 1799 - Seeding machine patent was issued to Eliakim Spooner in 1799. 1804 - Educational society was established in Pawlet in 1804. 1813 - Globe factory was established in 1813 by James Wilson of Bradford for the manufacture of geographic globes. Wilson made the first artificial globe in America in 1799. School for higher education of women was established by Emma Willard at Middlebury in 1814. Steel carpenter's square was invented by Silas Hawes of Shaftsbury in 1814. 1819 - Private military college was established at Norwich in 1819 by Capt. Alden Partridge. At that time, it offered the first Civil Engineering course. The college was later moved to Northfield. 1823 - Normal school exclusively for the preparation of teachers was established by S. R. Hall in 1823 in Concord. Hall also wrote the first textbook on teaching and was the first person to use the blackboard in the classroom. Platform scale was built by Thaddeus Fairbanks at St. Johnsbury in 1830. Fishing spoon lure was invented in 1830 by Julio Buel of Castleton. 1834 - Sandpaper was invented by Isaac Fisher at Springfield in 1834. Electric railway (1837), printing press, piano, and motor (1834) were built by Thomas Davenport of Brandon. He was also the editor of the first electrical journal. Marble cutting saw was invented by Hiram Kimball of Stockbridge in 1837. 1844 - Laughing gas was discovered by Gardner Colton of Georgia. Horace Wells of White River Junction was the first person to use laughing gas as an anesthetic for pulling teeth in 1844. 1800's - Toy carts, violin cases and guitar cases sold in America were invented by Joel A. H. Ellis of Springfield in the mid 1800s. Ellis also invented doll carriages and jointed dolls. Postage stamp used in America was made in Brattleboro in 1846. Steam-heated factory was the Burlington Woolen Company in 1846. Agricultural land grant college act, proposed by Senator Justin Smith Morrill of Vermont, was signed by President Lincoln in 1862. Agricultural society for dairymen, the Vermont Dairy Association, was organized in 1869 in Montpelier. Pulp paper mill was established in 1869 by William A. Russell in Bellows Falls. Russell later became the first president of the International Paper Company. 1872 - US President Calvin Coolidge was the only president born on the fourth of July. Born in Plymouth 7/4/1872. 1890's - Rudyard Kipling, living in Vermont in the 1890's invented the game of snow golf. 1891 - Flat turret lathe, a basic industrial tool, was invented in 1891 by James Hartness of Springfield. 1892 - American Morgan Horse register published in Middlebury in 1892, establishing first American breed of horses. 1895 - Successful photographs and measurements of snowflakes and raindrops were made by Wilson A. "Snowflake" Bentley in 1895. 1896 - State absentee voting law was enacted in 1896 by Vermont. 1903 - Person to cross the entire United States by automobile was Dr. H. Nelson Jackson, a Burlington physician, who traveled from San Francisco to New York City in 1903. 1907 - Horse farm operated by the United States government was established in 1907 at Middlebury. Morgan Horse Club founded in 1909 at White River Junction. Boy Scout Club was organized in Barre in 1909 by William F. Milne, a Scottish immigrant. 1919 - 300 mile endurance horse race was from Burlington, Vermont to Camp Devens, Massachusetts, in 1919. 1933 - Woodstock in central Vermont became the site of the nation's first ski tow. Air Traffic Regulations course was set up in 1934 at Norwich University in Northfield. Commercially viable ski tow in the U.S. was operated in Woodstock on Clinton Gilbert's farm in 1934. 1935 - State symphony orchestra was organized in 1935, with Alan Carter of Rutland as its conductor. State anti-sit-down strike legislation was enacted in 1937. Beneficiary of monthly Social Security payments was Ida M. Fuller of Ludlow who received check #000-000-001 for $22.54, January 31, 1940. Chairlift was used on Mt. Mansfield in 1940. Wind turbine used to generate power for an alternating current power system was operated at Grandpa's Knob in Castleton in 1941. 1946 - United States Ambassador to the United Nations was Warren R. Austin of Burlington(1946). Before that, Austin was a United States Senator. 1952 - Woman to win Olympic gold medals in skiing was Andrea Mead, of Rutland, in 1952. 1954 - Woman elected Lieutenant Governor was Consuelo N. Bailey in 1954. 1965 - Head Start Program (1965), used to prepare disadvantaged preschool children for elementary school, was started in East Fairfield with 12 children. American gold medal in the Olympic three-day individual equestrian event was won by Tad Coffin of Strafford in 1976. American medal in an Olympic nordic skiing event was won by Bill Koch of Guilford in 1976. 1978 - First Ben and Jerry's Ice Cream store opened in Burlington. 1996 - Until 1996, Vermont was the only state without a Wal-Mart. State to offer troops in the Civil War was Vermont. Montpelier, with 8247 residents, has the smallest population of any state capital. Montpelier, Vermont is the only US state capital without a McDonalds. 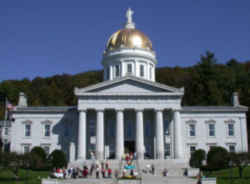 Vermont's state capitol building is one of only a few to have a gold dome. A statue of Ceres sits atop the dome. 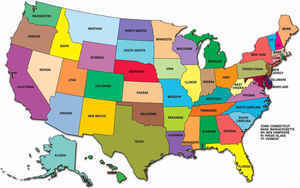 Vermont was the first state after the original 13 colonies to join the United States. Vermont's largest employer is IBM.